Hi, I'm Matt. Now, where to start? I'm Matt. I'm 30, from Vancouver, BC. Honestly, I don't like writing about myself; I've always been more of a behind the scenes kind of guy. This is an open space to share stories, photographs, videos and pointers from a wandering life, from the emotional and practical, to the hilariously embarrassing. Filmmaking and entrepreneurship dominate my life, and those two things take me to some of the most remote, diverse corners of the planet. No matter what I'm doing, one thing has remained constant: I have an insatiable desire to explore; from people and cultures, to history, nature, wildlife, politics and everything in-between. I started this page with a simple mission: I hope my stories, photos and videos can help inspire people to become more aware of themselves, challenge the status quo in their lives, and treat others with greater compassion, empathy and understanding. After a last minute phone call, I was invited to join my friend, and professional underwater photographer, Karim Iliya on a special trip to document humpback whales in Tonga during calving season. Jumping off a boat into the warn, azure waters off the coast of the Tongan islands in the South Pacific seems like a dream, now imagine that same feeling when there are a couple dozen fully-gown humpback whales travelling full speed right at you. It's heart stopping. The adrenaline was pulsing through my veins, I almost forgot how to swim. Peaking up above the surface I was able to see the breathing holes on their backs as the whales dove in and out of the water, weaving through the surface effortlessly in pursuit of a female lead. It was like swimming against traffic, and coming at me were fifty-foot long whales with one thing on their mind: mating rights. Want to learn how I got here? Read some of my stories below. Humpback whales are highly intelligent and sentient animals, and they are known to express a high degree of empathy for other living creatures. One's ability to build trust with them completely defines the quality and length of your interaction. The Vava'u Islands are part of the Kingdom of Tonga, situated in the northern part of this Polynesian kingdom between Fiji and Samoa. Deeply religious yet laid back, and with appetites of steel, Tongans are a happy bunch to hang with. I've been a photographer for a good fifteen years, yet I had never experienced a professional underwater shoot before, until Tonga. I'm now hooked. Here are some pointers for photographers interested in going u/w. I was invited to join the Canadian Military on their winter Arctic sovereignty operation in Nunavut. Yes, that's right, winter, in Nunavut! 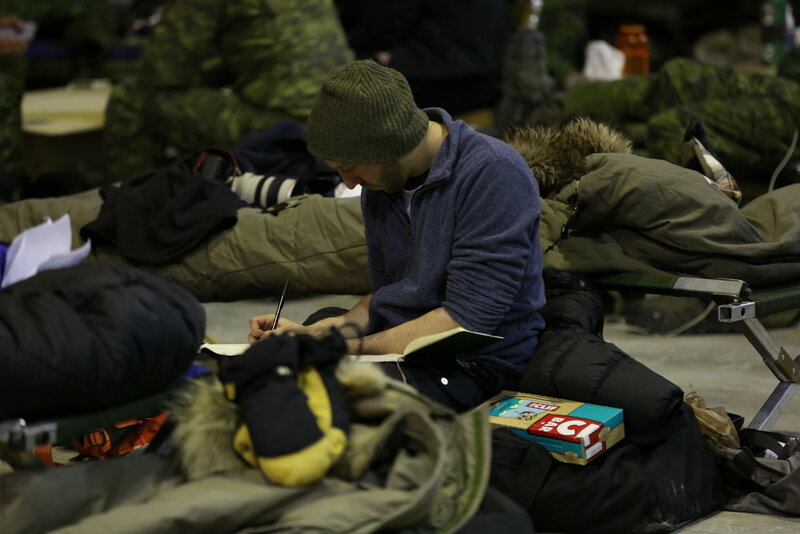 This February, I joined the Canadian Armed Forces on their annual winter sovereignty exercise-- Operation NUNALIVUT. I flew from rainy Vancouver to snowy Yellowknife to rendezvous with the Military's Joint Task Force North headquarters. I met Major Bilodeau in the lobby of the Discovery Inn downtown "Arctic ready," or so I thought. After a brief safety rundown, I boarded a RCAF Hercules bound for Nunavut. As I peeked out the window all I could see was a snowy, icy desert below-- this was going to be two weeks of something else entirely. Touching down in -55 degree weather proved to be a strong, slap-in-the-face reminder of just how challenging Arctic survival is. There is nothing quite like going to the Arctic in the middle of the winter. The Rangers are the Military's "eyes and ears on the ground" across vast swathes of unpopulated, inhospitable territory. They are true experts in Arctic survival. Challenges are around every corner in the Arctic in the winter. Deadly cold temperatures, polar bear attacks, a slip through the sea ice, lack of food, and malfunctioning camera gear. This piece specifically deals with that last one. Our home base in the Arctic was a WWII airplane hanger, converted by Military engineers into a livable (and heated) base. My many nights here spent embedded with the Forces turned out to be a deeply personal experience. So what's it like to visit North Korea? There are tons of blogs and articles that address that question. But I think I can do a little better. Let me explain myself. North Korea, officially the Democratic People's Republic of Korea, has fascinated me since I spent a university study-abroad semester poking around the Chinese-North Korean border back in 2008. While many my fellow foreign students would head off to party, I would spend many a Friday night on slow moving Chinese trains taking shots of baijiu with locals on our way to various Chinese border cities with North Korea: Tumen, Dandong, Hunchun, Ji'an, Changbai. I had an insatiable desire to visit them all, just to take a peek into life over the border. This curiosity never let up, rather it grew overtime. Little did I know it at the time, but this would mark the beginning of over a decade of research and efforts I've taken in North Korea. Why the hell did I start working in North Korea? "Why" is the most common question I get next to "is it dangerous?" And it's equally difficult to answer. What the hell was I thinking? And what good can come of it? Tourism in North Korea is the source of a lot of fascination and controversy, and rightly so. So, I'd like to address some of the hardest and most legitimate questions. It's no secret that tourism in North Korea is one of the most restrictive in the world. All foreign tourists must always be accompanied and follow a set itinerary. Greenland's summer temperatures hardly get into the double digits, but a works of water and ice opens itself up to some serious exploration. Hardy, friendly people, a slow pace of life, limited resources and no trees? Oh and let's not forget a wonderland of icebergs, ice fjords, glaciers, jagged rocky peaks and colourful houses. While on many maps it looks like it's almost the size of Africa, Greenland in actuality is around the same size as Mexico, but located much further north. A country in the Danish realm, Greenland combines elements of Inuit culture with Scandinavian. Greenland's remoteness and sparse population make it an expensive travel destination. This article offers some vital pointers on how to travel independently in East Greenland on a budget. Being amongst the icebergs was an incredible feeling that I cannot use words to describe. The sheer size of them was jaw dropping, and every few minutes one could hear cracks and breaks followed by a splash across the fjord as ice blocks calve off and fall into the sea. Ammassak, a small, slender fish, were gathering along the fjords in massive numbers to lay eggs. We took the dingy past what seemed like a gate of icebergs, carefully navigating around them from the harbour to the sea before turning down a nearby fjord.